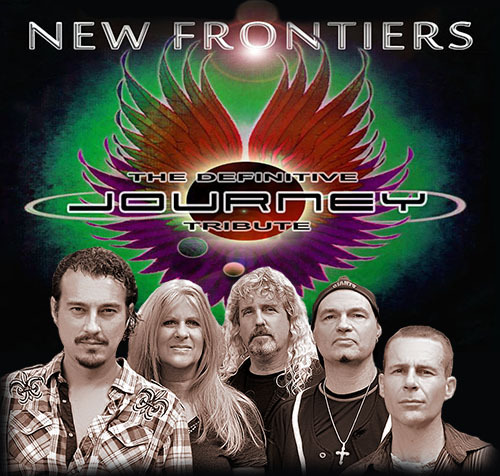 New Frontiers: The Definitive Journey Tribute was formed in 2015 by guitarist Jimi Goare, with the idea that the MUSIC of this legendary band be paid its proper due. Instead of emulating other tributes that “look” like Journey, New Frontiers chooses to focus on recreating that classic Journey sound that everyone knows and loves. From Neal Schon’s signature guitar tone to the lush harmonies that Journey is so famous for – lead vocalists Cliff Stanton and Jimi Goare are able to match the soaring voice of Steve Perry while engaging audiences with that familiar Perry banter. With a veteran line-up and Goare’s abilty to match Schon’s classic guitar solos note for note, the band is a formidable alternative to other Journey tribute bands around the nation.